Does social media help or hinder the creative process? So many writers are on Twitter and Facebook chatting with other people in the same position. Everything from sharing common experiences, information about who to query, and joining critique groups are part of the wonderful things social media can offer. There are a number of things not to share on social media and ways that social media interferes with your goal of getting published. Many agents, including myself, look for writers on Twitter once we’re wowed by your query or writing samples. What we’re looking for is daily posts, something funny or intriguing and a voice that we want to get to know. Twitter is only 140 characters, but that’s ample room to show your chops as a writer and get your unique voice out there. I mentioned above some things we like to see in Twitter. Here is something we don’t like to see: confessions about your writing that raise some red flags. Such as you’re not sure you have another book in you, you’re not sure what genre you fit into, you don’t actually read at all or see why writers need to read. Believe me, I’ve seen this all on Twitter before. Think about what is appropriate to share and if a potential agent or editor was watching, what voice would you want to project? Submission lists, number of agents you’ve queried, full manuscript requests, phone calls and meetings with agents–are all things that you need to keep to yourself for your best interest. You want to be a hot project and you want to keep your cards close to your chest. Don’t give everything away on platforms that are public. 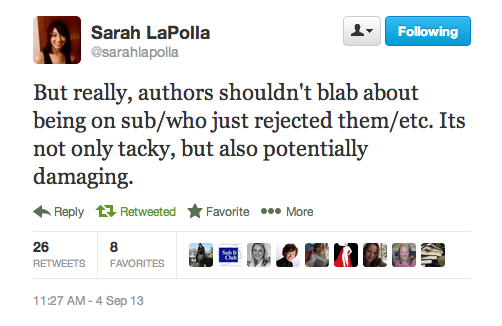 Agent Sarah LaPolla tweeted this sentiment last week and it caused lots of discussion! We’ve all had days where we’d rather check Facebook and Twitter than work, but it’s important to know when it’s social media time and when it’s writing time. If you think that fiction authors need to build their platform more than they need to perfect their craft you’re wrong. Writers need to write in order to get better and in order to accomplish your goals. Finishing a 80k word novel isn’t easy. It takes great time management skills, and social media management skills. If you are a non fiction author you should be targeting your social media towards your market and your potential consumers, not fellow writers. Find your niche and engage in social media within it. Join Facebook and LinkedIn groups. Add people to your Twitter Lists. Negativity, over-sharing, spilling details that are private are all social media habits that are not desirable for a business partnership. Yes, Twitter is a place to vent and share common anxiety in the publishing process, but you should be thinking about the end goal. Fake it ’til you make it. Be the persona on social media today that you want to be when your book publishes. One of the wonderful things about social media and blogs is that agents and editors share their likes and dislikes, what they’re looking for and what doesn’t work for them. Engage with the platforms, comment on blog posts, get your name out there in a positive way and pay it forward. Find the social media platform that best suits you and dig out all the useful information. Great post. Great tips to keep in mind. These are all very good points. It makes me wonder however if literary agents are spending more time making decisions based on opinions on social networking rather than on the work of a manuscript. My note at the start of the post was to frame where agents are coming from. It’s only *after* we’ve fallen in love with sample material do we take to social networks to see if authors would be a good fit for us. Great post. I especially appreciated the non-fiction advice. That’s a really important point and one that many writers of non fiction don’t always think of. I understand that 140 characters can provide compelling content. So much communication is now reduced to one liners, sound bites and information mc’nuggets. However, I’m not sure that those adept at this distillation necessarily have the chops to turn out more substantive work. I would hope that time is also allocated for deeper and more thoughtful vetting. Great comment. That’s why we’re in the books business! I’m definitely about more than 140 sound bytes. Give me a 300 page novel any day. Working with smart, interesting writers is the best part of my job. They are six important points to bear in mind. Thank you. Thank you. I learn something from you every time you post. It’s tricky to try to build a platform while still seeking representation for a manuscript. Every tip is appreciated! I have such a love-hate relationship with social media . . . I can see I need to be a bit more strategic and consistent about how I use it. Thanks for this helpful info! Love this! Use social media….don’t abuse it. Thanks for sharing Carly! And on the flip side, authors who under-use social media! Do you have any plans on developing a marketing plan, by the way? This was an interesting post. I’m surprised that only Twitter was mentioned. Do agents/publishers generally not care about your Facebook page/whether you have a blog following or not/etc? It depends on what your book is, in my opinion. For non fiction, Facebook can be really powerful. For debut writers, you aren’t going to get as far with a Facebook Author Page because you don’t have a track record yet. Practical pointers. Twitter is a tightrope for me. On the one hand, I am in no danger of over-sharing. My social media face is my professional face. Period. On the other, I don’t want daily quips to sound authentic, not scheduled. I’m much better with FB, so play to that strength, and I like that I’ve been able to echo my WP banner on my FB page (branding yada yada), but based on this post and your most recent reply, I’m rethinking my Twitter presence. Thank you, Carly. All good points! I agree, my Twitter presence is my ‘professional face’ too. I’m always working at incorporating personal tidbits while keeping it in line with the message I’m trying to put out there into the world. This info is very helpful! As a writer seeking representation, I’m wondering if my tendency to shy away from social media could be working against me. I like using online networks that relate to my craft such as GoodReads and blogs, but I’ve never been a fan of Facebook and Twitter. As an agent, do you find it questionable if an aspiring author doesn’t have much of an online presence? For fiction it’s hardly necessary. 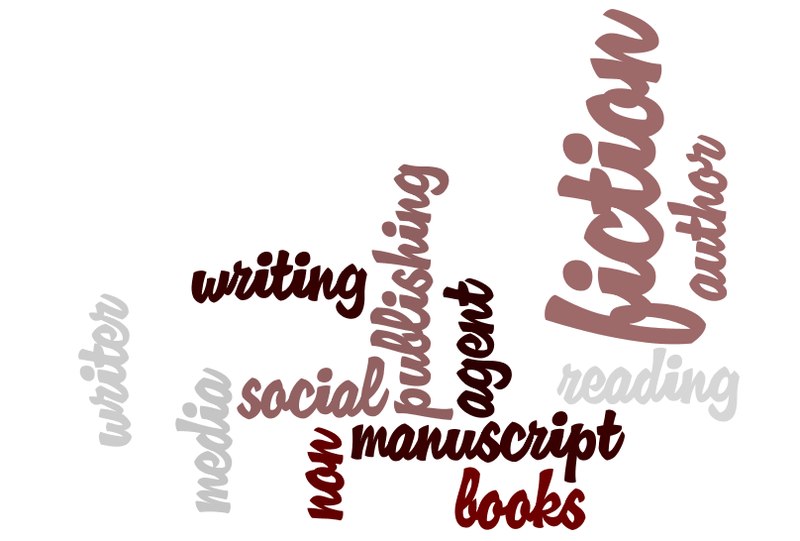 Once you have a book deal and you start to think about promotion you’ll want an author website and possibly a blog built into the website and maybe a Twitter feed or Facebook page to keep fans updated. But fiction needs to stand alone. If you’re focusing on writing a good book first you’re on the right track. Thank you for the advise and reminder. Common sense is always a polar star! Thanks for the tips, Something to think about the next time I post anywhere. What would an agent think? What would an agent think if they saw one of your post on Twitter, or Facebook..
or dirt entering through footsteps. do for the mopping. One can make it at home by mixing vinegar and water. minerals. Never use harsh floor cleaners. Sweep or vacuum clean. or clear) on the grout which will not only protect the surface but also acts as an anti-fungal agent. affordable price. Moreover the price depends on the type of the tiles, number of tiles and size of the tiles to be cleaned. I review YA books on my blog. If I want to write and publish YA books, is this a bad idea? I don’t swear or use crude humour. I had honestly never thought of it as a bad idea before. I am turning your fan. Till few days back when I started looking out for an agent, I felt scared beyond words- FINDING AGENT- felt like finding a needle in the haystack. With the information you have given in your e-book, plus your blogs, gives me the IRON MAN confidence, if you want to find the needle, just bring a great magnet close to the haystack.